Business is all about standing out and making a statement so that you reach more people and turn them into your loyal customers. This is why business enterprises all over the world rely heavily on advertising flags as one of their main marketing strategies. Your competitors are in the market trying to do the same thing – attract more customers. So how well you do it will make all the difference in the end. always on the go; they don’t really have the time to read your ad in the newspaper or watch your TV commercial so you have to draw their attention while they are on the move. 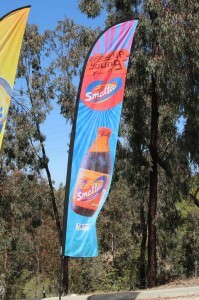 It is not a surprise that many businesses have used these promotional flags and banners to their full advantage. The advertising flags are attractive due to their colorful and eye-catching graphics, their sleek designs, and where they are located. Streets are packed with people and these banners and the flags are placed in public places so as to draw maximum attention towards them. It all pays out in the end making it such an important tool in the advertising world. They are customized, catering to your business needs and requirements and are able to reach a larger customer base. They have definitely proved to be a successful tool to bring customers through your door without being too harsh on your budget, creating a win-win situation for all.